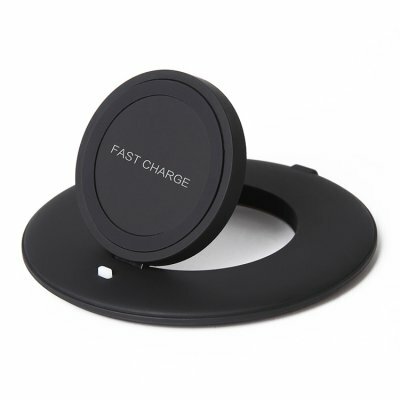 Successfully Added Wireless Fast Charger - Foldable Design, Ultra-Slim, Lightweight, 10W Quick Charging, 4 to 8mm Charging Distance to your Shopping Cart. Charge your smartphone in the blink of an eye with this ultra-slim wireless fast charger. With sleek and compact body, this wireless charger can be easily carried around or placed in your room without taking up too much space. It has been crafted out of durable ABS material which gives it a premium feel and look. All you have to do is insert its micro USB cable, and you’ll be ready to go. Simply place your phone near the wireless charger, and your smartphone will be charged instantly. Thanks to its 10W fast charge support, you can be assured that your battery will be filled up in no time. Your gadget features a 4 to 8mm charging distance. With its foldable design, you can either charge your phone while lying flat, or use it as a stand. The latter allows you to comfortably watch a movie from your smartphone while simultaneously charging its battery. Like this, you’ll never have to worry about running out of juice again. The wireless charger comes with a 12 months warranty, brought to you by the leader in electronic devices as well as wholesale smartphone accessories..